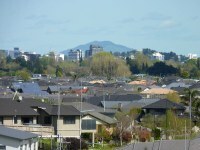 Hamilton is a pretty town 80 miles (128km) south of Auckland. Its proximity to the bigger city means it is often overlooked by tourists in New Zealand, however as an excursion from Auckland, Hamilton has some worthwhile sights to offer. There are several hot springs around Hamilton, and the city is full of gardens, parks and river walks. Not far out of Hamilton is Matamata, home to the Hobbiton Movie Set, the 'Hobbit village' created for The Lord of the Rings film trilogy. Guided 'film and farm' tours are offered for fans of the movies.